Ruling allies BJP and Shiv Sena, whose relations have been strained for quite some time, Monday announced a tie-up for the coming Lok Sabha and Maharashtra Assembly elections. The BJP will contest 25 seats and Shiv Sena 23 of 48 Lok Sabha seats in Maharashtra. The two parties will contest equal number of seats, along with their other allies, in elections for the 288-member state Assembly, due this year. In a joint press conference with BJP chief Amit Shah and Sena chief Uddhav Thackeray, Maharashtra chief minister Devendra Fadnavis said public sentiment was that the two parties should come together. 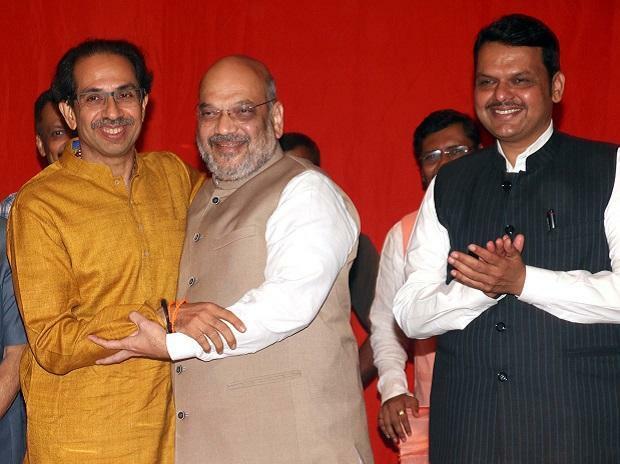 The BJP and Sena alliance will win at least 45 of the 48 Lok Sabha seats in Maharashtra, Shah said. Crores of workers of BJP and Shiv Sena wanted the alliance between the two parties, Shah said. The Sena is the oldest ally of BJP, he added. The Ram temple has been the common thread for alliance between BJP and Shiv Sena, Thackeray said. It has to be built at the earliest, he added. BJP and Sena are parties with national ideology which have come together in wider public interest, Fadnavis said. In principle, both the parties are pro-Hindutva, he added.